One of the smallest, yet most significant changes I’ve made in my training over the years is how I brace for a squat and deadlift. It’s important to have a strong core to stabilize your spine under a heavy load. The stronger your core is, the better your body will be able to maintain proper position during a lift. This article will teach you how to perform, regress/progress, program and correct the most common mistakes for three of my favorite ab exercises for a stronger core: High Tension or RKC Plank, Ab Wheel Rollout, and Hanging Leg Raises. The High Tension Plank, or RKC plank is a great exercise building anterior core strength and the setup is very similar to a standard front plank. It’s a simple body weight exercise that doesn’t require any equipment. It’s great for building strength and learning how to create tension through your entire body. I like to program these in the warmup and the end of workouts. I do 2 sets of 10 – 15 seconds at the end of the warmup to turn my abs on and feel that tension I’m going to be creating in my work sets. At the end of the workout, I like to do 3 – 5 sets of: 10-15 seconds (high tension plank) / 10 seconds standard plank (low tension) / 10-15 seconds (high tension plank / 10 standard plank (low tension) / 10-15 seconds (high tension plank). • Tightly Interlock your fingers and pull your shoulders down via a reverse shrug. • Keep your neck neutral and stare at your fists. • Keep your legs at hips width and squeeze your legs together like you’re trying to pop a ball between your thighs. • Straighten your legs hard, flexing your quads. • Tuck your tail between your legs, flexing your glutes. • Pull your elbows towards your toes, pull your toes towards your elbows (neither will move because they are firmly planted in the ground). • Create tension through your entire body and become immovable. • Mistake: Arching your back. • Correction: Round your lower back to the ceiling. Round your bottom ribs into your bellybutton. • Mistake: Hips too high. • Correction: Squeeze your glutes tight! Point your belt buckle to your face. • Mistake: Pulling your head up or hanging your head down. • Correction: Remain neutral, stare at your hands. • Create tension the entire time. If this is not challenging after 15 or more seconds, you are not tight enough! This is my personal favorite ab exercise. Ab wheel rollouts are great for improving core strength and stability. It’s another great anti-extension core exercise that forces you to use your abs to prevent you from slipping into lumbar extension, or arching of your lower back as you rollout. 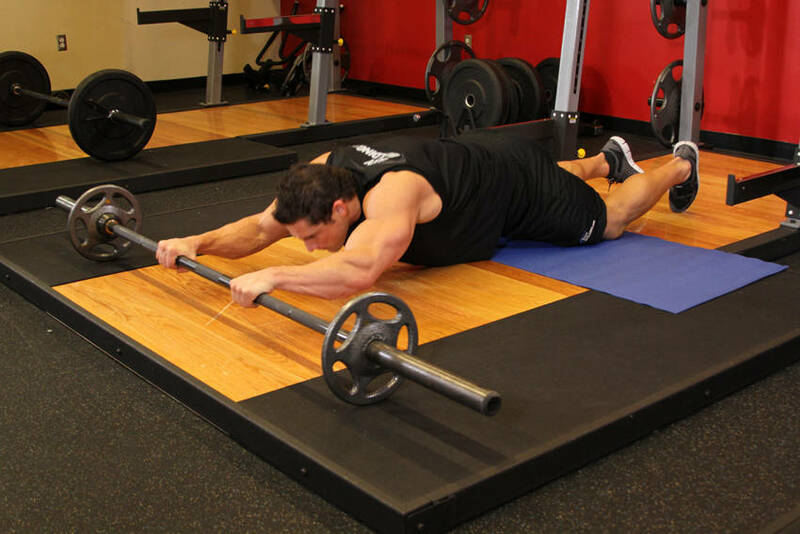 If you don’t have an ab wheel, a barbell is a great alternative. I program 3-5 sets between 8 – 12 reps.
You can easily regress this movement by rolling out a shorter distance. You can also use a stability ball to perform rollouts. Make it more challenging by extending the lever. Start in a standing position and fully extend. Many people perform the ab wheel rollout incorrectly and put a lot of stress on their lower back. You want to maintain a neutral spine position throughout the movement. Here’s how to do it correctly for optimal safety and performance. • Glutes and abs tight. • Initiate by moving your hips forward. • Extend your hips through, lean forward and rollout until your arms are overhead. • Keep your lower back in a neutral position as you rollout and go until your torso is parallel to the floor, or as far as you’re able to. • Pull the wheel back and return your hips to the starting position. • Mistake: Arching/hyperextending of the lower back. • Correction: Try rounding your lower back towards the ceiling as you rollout. • Mistake: Initiating by rolling the wheel out first. This will likely put your low back in an extended posture. • Correction: Move at your hips first, your body will move and the wheel will follow. It will stay under your body until your hips extend and you can continue to rollout with your arms. The HLR is a great exercise for building core, grip, lat strength and more. The HLR can easily be progressed or regressed. To regress, keep your legs bent at the knees. Bring your knees up towards your face. When that becomes easy, you can do the same thing and add weight. Simply load it by putting a dumbbell between your feet. From there, progress it by increasing the lever and doing it with your legs straight like in the video. Advance it further by bringing your toes to the bar. I like to program these at the end of my workouts. 3 – 5 sets of 8 -15 reps.
• Start in a hollow body or neutral spine position. • Raise your legs towards the bar and bring to 90 degrees (or higher). • Lower your legs in a controlled manner and return to starting (hollow body) position. • Mistake: Hanging with an arched back. • Correction: Point your belt buckle to your face. • Correction: Go slow and control the eccentric, or down phase and return to your starting position. These are three of my favorite ab exercises. They are simple to perform. They don’t require much equipment. When done correctly they are extremely effective for building anterior core strength and stability. I recommend starting with the regressions and work your way up to the more advanced progressions. If you have any questions or comments about any of these exercises leave a comment below or send me an email at adamnpine@gmail.com with “LIFT” in the subject line. This entry was posted in Uncategorized on July 6, 2015 by adamnpine@gmail.com.